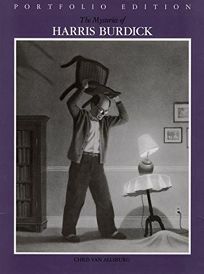 A new portfolio edition offers the artwork from Chris Van Allsburg's The Mysteries of Harris Burdick, originally published in 1984, in loose oversized sheets. The enigmatic black-and-white drawings are each accompanied by a title and brief caption: for example, a picture of a nun placidly sitting in a chair floating in a cathedral is labeled ""THE SEVEN CHAIRS: The fifth one ended up in France."" The portfolio also includes a 15th drawing, discovered under circumstances as mysterious as the original set. A new Internet site, set to launch on October 28, will encourage the use of the pictures to seed creative writing assignments.